Founded in 1897, Troutman Sanders LLP is an international law firm with more than 650 lawyers practicing in 16 offices located throughout the United States and Asia. The firm’s clients range from large multinational corporations to individual entrepreneurs and reflect virtually every economic sector and industry. The firm’s heritage of extensive experience, exceptional responsiveness, and an unwavering commitment to service has resulted in strong, long-standing relationships with clients across the globe. 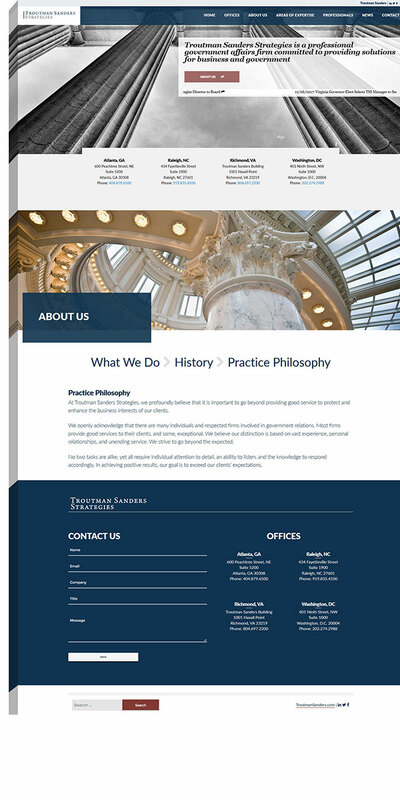 The web design was a portrait of Troutman’s mission, showcasing the heritage and breadth of the company, and driving the company’s core mission. The responsive website builds off brand strategy, emphasizing the core values and global reach. Focusing on the company’s past experience and growing capabilities, 80Port’s design team leveraged its deep experience in professional services design to create a website that speaks directly Troutman’s international audience. Their new website clearly positions them as a dominant global leader in the industry for many years to come. Part web design shop. Part digital marketing agency. 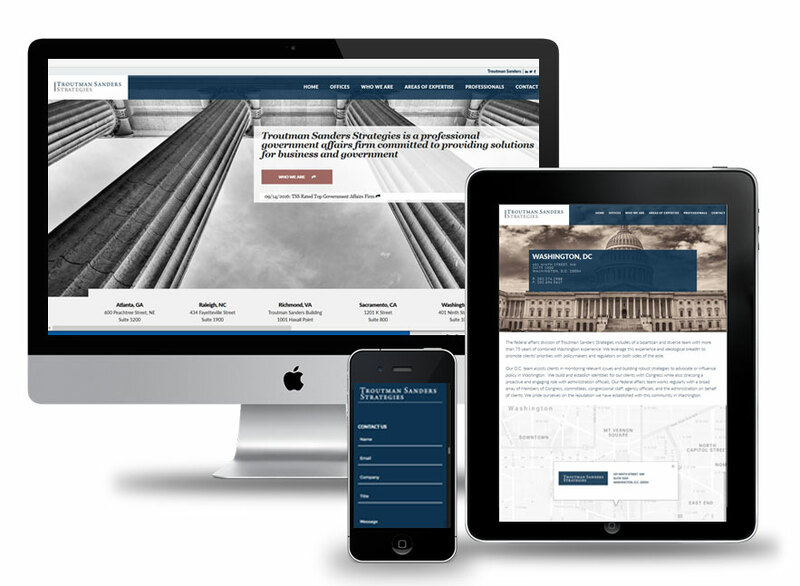 Troutman Sanders Strategies - 80Port web design agency in DC is a full service marketing and digital design agency. We provide custom web design for Washington DC Area startups and established corporate clients. We dive into your goals to devise an engaging experience for your target market. Our clients are our partners. We build relationships that last from conception of a project to reflection and measuring results. We believe that this is the only path to success - to follow a process designed to fulfill your expectations and create an immersive experience for your audience. Project success doesn't happen by accident. It requires a disciplined process with a focus on key objectives. We take the time to get to know you, to know your audience and to understand what we want your audience to do.